The Weaver story began in the 1950s when Ben Weaver, a mason by trade, crafted his skill in the Massillon and Akron area. Over the next decade Ben built a few homes every year. With aspirations of building homes in Wooster full time, Ben and his wife Ada Mae sold their family farm to pursue their dream. Their desire was to not only build clients a beautiful home but to build with uncompromising quality and to treat people with honesty and integrity. Ben was committed to being a leader in the industry and was one of the founders of the local Home Builders Association. Today, numerous single family and condo neighborhoods are tributes to Ben’s philosophy of building homes with enduring quality and investing in his community. Over the years, several of Ben and Ada Mae’s children and grandchildren have been part of the growth and continued success of the company. 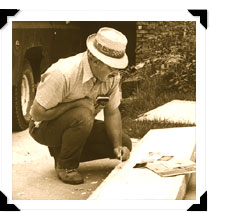 While the values of excellence and integrity remain the foundation of the company, Merle Stutzman, President/Partner, had a vision to expand into new markets and integrate new technology into our design and building process. Designing floor plans and elevations with the latest software allows WCH to create realistic images in 3D to bring your dream home to life. In 2010 WCH entered the Columbus market building a Parade Home in New Albany. In 2014, the company purchased and renovated a historic building in downtown Wooster, Ohio for their new Design Center and corporate office. The award winning Design Center offers inspiration and showcases design elements that you can touch & feel and incorporate into your new custom home. Today, we still do business the old fashion way…. we look at each home we build like it was our own. We believe a custom home isn’t measured in square feet, it’s measured by you. Our homes are not only beautiful but also very livable, designed for the way you live today and years to come. We have a passion for what we do – no matter the location or the investment range, our first priority is to build you a welcoming place where your family will create memories for decades to come. Our professional team offers decades of real world experience in all phases of floor plan creation, interior design, and construction which provides our foundation for building beyond our client expectations. Each member brings a different background and unique set of skills to the company, which allows us to look at each home from a different perspective. In addition to experience, when designing your home, we want to ask the right questions. We want to ensure that your home not only matches your vision today but will also meet your changing needs in the future. You’re in good hands! We have built a reputation for quality craftsmanship, attention to detail and personalized service. Just the right size, we’re big enough to have good processes in place but small enough that every client is our friend and someone we get to know. We really want to understand your lifestyle, things about your family, how you like to entertain and spend your free time. We want you to enjoy the whole process and feel a part of the team. 2017 HBA Parade of Homes Construction Has Begun! Weaver Custom Homes was awarded the Main Street Wooster Design Award 2015, for our historic office renovation. Weaver Custom Homes was awarded Small Business of the Year Award by The Wooster Area Chamber of Commerce, 2015.